No, it sounds chilly and protocol. Once again. Hello!!! OK. It`s much better this time. You are welcome. I`m about to start, but I`d like to tell first about the things I`m going to show you. I need to do this to get my thoughts together. I remember there was a poster on the classroom wall at the school I studied with Lomonosov`s saying(I think such dazibaos exist even today as the system of education has hardly changed) stating that the great scientist used mathematics for the same purpose. Different things work: I prefer chatter. So, having looked through the list I had, I decided to use elimination approach and to decide which of the games I won`t mention. In view of my integrity and uncompromising stand I tossed aside all examples from the Russian club forum. Overwhelming majority of Dagomys games were annotated in print and on the web-sites. To avoid any accusations of misinformation I would like to amend my promises: the winner game Moiseenko – Svidler will be published in the 6th issue of '64-Chess Review' and because of the lack of 'journal space' (as Soviet executive managers put it) we have to publish the encounters Chernishov – Grischuk and Gelfand – Malakhov in the next issue. I also spoke to Sergei Shipov about the game Zvjagintsev – Bareev that finished 5th and asked if there were anything to add to his comments on ChessPro. He answered that there was a finishing off after Evgeny`s mistake, and before there was all theory, so he suggested to decide myself whether to pile up unprincipled variations with the help of database and engine or not. I preferred to spare my effort, as I will need it for the rest of the games. I will also mention the encounter Dreev – Karjakin, that has already been annotated by Alexei in the issue 5 of '64', and then I start. It seems to me that Russian reader is not very well-acquainted with this selection, so at least an educating mission is feasible, but it`s difficult to predict the possibility of getting the beauty over to the reader. I will start with a game that fascinated me with the final position. Evgeny Gleizerov who gave the 6th place to this miniature, reciprocates my feelings: 'it's clear that computer finds 25.Јg4!! in a few seconds. So what? Are there many human players who would manage to notice this beautiful mate performed by White from a distance? I doubt.' One can answer back: 'Is it possible to call 30 moves game a miniature? We are not in Brobdingnag yet.' Let`s count: 16 theoretical moves plus 2 moves of position repetition – not much is left on the independent play. Besides, after 28.¤e7+ one could have figured everything out straight away and stopped the clock. I`m sure that Anatoly Matsukevich would support me. 1.e4 c6 2.d4 d5 3.¤c3 dxe4 4.¤xe4 Ґf5 5.¤g3 Ґg6 6.h4 h6 7.¤f3 ¤d7 8.h5 Ґh7 9.Ґd3 Ґxd3 10.Јxd3 e6 11.Ґf4 Ґb4+ 12.c3 Ґe7 13.0-0-0 ¤gf6 14.ўb1 0-0 15.¤e5. 15...c5. The main continuation here is – 15...Јa5, and then White chooses between immediate 16.¤e4, that was played in the game Bologan – Dreev, Poikovsky 2002, and 16.¤xd7 ¤xd7 17.¤e4, that happened in the game Topalov – Leko (Dubai 2002) and also in an encounter that took place this year between two people, whose names provide us with certain associations: Karpatchev – Kasparov. 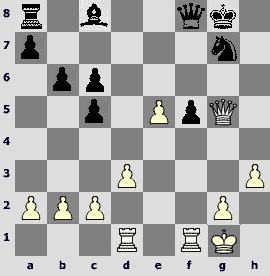 Speaking seriously, Sergei Kasparov from Belarus plays this position well with Black, so he defeated his 'arch-rival'. 16.Јf3. Leko preferred16.¤e4 in the game against Anand (Corsica 2001), but after 16...cxd4 17.Јxd4 ¤b6 18.¤xf6+ Ґxf6 19.Јe4 Јe7 20.¤g4 ¦fd8 21.¤xf6+ Јxf6 22.Ґe3 ¦xd1+ 23.¦xd1 ¤d5 24.Ґd4 Јf4 there ending was even. 16...Јb6?! In the original game Chandler – K. Berg (Germany 1986) Black acted more carefully - 16...cxd4 17.¦xd4 ¤xe5 18.Ґxe5 Јc8 19.¦hd1 ¦d8 20.¤e4 ¦xd4 21.¦xd4 ¤xe4 22.Јxe4 b5 23.¦d3. There is a pressure from White but nothing can be done: Caro-Kann suffered himself and willed to us. And now events start moving with undesirable for Black rashness. 18.d5! exd5? d5 pawn had to be left alive– 18...¦ad8 or 18...¤f6. As a result there could appear a weak one on e6 or a strong one on d6, but this would be better than a knight on f5. 19.¤f5 Ґf6 20.¦xd5 (the rook aims both at d7 and at d6) 20...Јe6. Black protects g4. To 20...Јc6 it`s possible to play 21.¤xh6+ gxh6 22.Јg4+. After the most stubborn 22...Ґg5 23.Ґxg5 f5! 24.¦xf5 hxg5 (24...¦xf5? 25.Ґxh6+ ўf7 26.Јxf5+) 25.¦xg5+ ўh8 26.¦g6 ¦f6 27.Јg5 Јe4+ 28.ўa1 ¦f7 Black does not lose by force, however his position is unenviable. A stronger blow for White is the same as in the game 21.Ґxh6!, and to 21...gxh6 comes intermediate 22.¦hd1!, that destroys a protective structure ¤d7+Ґf6 (weaker is 22.Јg4+ ўh8 23.¦d6 ¦g8). 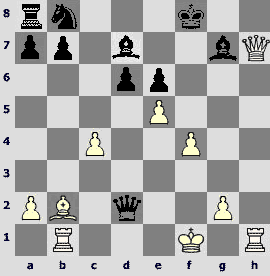 In case of the exemplary 22...¦ad8 23.Јg4+ ўh8 24.¦d6 ¦g8 25.¦xc6 ¦xg4 26.¦xf6 White has a won ending. After the move in the game he could have used positional means to increase the pressure, but youth has other priorities. 21.Ґxh6! ¤e5. In case of 21...gxh6 22.¦d6 he would have to part either with the knight or with the queen, as 21...gxh6 22.¦d6 leads to a checkmate. 22.Јe4 ¤c6. 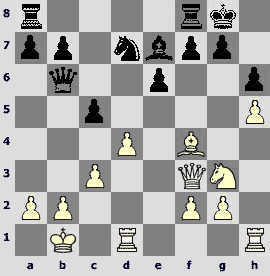 If 22...gxh6, then 23.¦d6 Јc4 24.¤xh6+ ўh8 25.Јxc4 ¤xc4 26.¦xf6 ўg7 27.¤g4 and White is two pawns up. The next move in the game looked like a plot of an action movie with, for example, van Damm starring. A hero struggles doughtily against scoundrels, but when it seems that truth triumphs something vexatious happens. As a rule, calvish, but a very beautiful girl butts in. Malign forces celebrate victory, disgusting laughter sounds everywhere, our hero is about to be done in, however unluckily for the scoundrels, laughter and vigilance are incompatible. The hero, smelling his oats, gives the coup. Usually it is a kick on the cheek in slow motion, but these details are not that important. 23...¤e5. It`s convenient for the scoundrels to have a draw, they are giggling, anticipating it with pleasure instead of recollecting themselves and depriving the hero of his major weapon – after 23...gxh6 24.¦d6 Јe5 25.¤xh6+ ўg7 26.¤f5+ ўh7 White`s attack is at a deadlock, the position is unclear. 24.Јe4 ¤c6 25.Јg4! A brilliant resource, scoundrels are getting depressed. 25...Јxd5 (25...¤e5 26.¦xe5 Јxe5 27.Ґxg7 Ґxg7 28.h6 loses) 26.Ґxg7 Јd3+. No quarter to be given: in case of atoning sacrifice of the queen 26...Јxf5+ 27.Јxf5 Ґxg7 the bishop should also be given - 28.h6 Ґe5 29.f4. An amazing combination crowns the game. 28.¤e7+! ўh7 (28...Ґxe7 29.Ґxe5+) 29.Јg6+!! fxg6 30.hxg6+ ўxg7 31.¦h7#! Magnificent mate. White has lost his queen, rook and bishop. Applause for a new rising star of American chess Lev Milman. There is the only thing that went wrong – a pretty girl perished in the final, which is uncustomary for Hollywood. Well, there is nothing to do about it – after all, it's a violent game. Black was defeated spectacularly in Caro-Kann in a game that took place in Dagomys – Landa mated Shaposhnikov. It doesn`t yield to the just examined example in the beauty of the final combination, but Konstantin said that his sacrificing cascade had already been calculated by Anand. It happened before that almost entirely home-prepared games were included in our best list, but Black played too naive in this game. Our next game was played in the same tournament as the previous one. Hikaru Nakamura is also young and talented, besides, he is distinguished. Impetuous attack is a characteristic feature of the USA champion`s enterprising style. 1.e4 g6 2.d4 Ґg7 3.¤c3 d6 4.f4 ¤f6 5.¤f3 0-0 6.e5 ¤fd7 7.h4 c5 8.h5 cxd4 9.hxg6. Another principled continuation of this extremely aggressive branch – 9.Јxd4 dxe5 10.Јf2 or even даже 10.Јg1!? 11...¤f8. Noteworthy is a check-up move 11...e6. It`s clear that there is no reason to count on 12.Ґxe6? ¤xe5. However, if a normal move 12.¤g5 follows, Black can enjoy the choice. 12...¤f8 leads to the same position as in the game, and 12...¤xe5 has its own meaning. Bad is 13.fxe5? cxb2 14.¤xf7 bxa1Ј 15.¤xd8, Black should not be tempted by the bishop с4 – 15...Јc3+ 16.Ґd2 Јxc4, as White creates an irrefutable attack by 17.Јf3 Јc7 18.Јh5. However, after 15...Јxe5+ any retreat of the king will be followed by the check with the queen (from a5 or f6), and a dangerous knight will be put out. There will be an exception for the move 16.Јe2, in case of which Black will be satisfied with the queens' exchange and possession of two extra pawns as in case of 16...Јa5+ 17.ўd1 Јxd8 White forces a draw - 18.Ґxe6+ Ґxe6 19.Јxe6+ ўh8 20.Јe4 Јg8 21.¦xh7+! Јxh7 22.Јe8+ Јg8. Practice proved that in the variation 13.Јh5 h6 14.fxe5 hxg5 15.Јh7+ ўf8 16.Јh8+ Ґxh8 17.¦xh8+ ўg7 18.¦xd8 ¤c6 19.¦xd6 ¤xe5 Black is out of trouble. This is certainly just my supposition, everything could have happened in a different way. 12.¤g5. The following draw has been known for a long time - 12.Ґxf7+ ўxf7 13.¤g5+ ўg8 14.Јh5 h6 15.Јf7+ ўh8 16.Јb3 Јa5 17.¤f7+ ўh7. However, it seems that Nakamura never plays for a draw. 12...e6 13.¤xf7 cxb2? This move and the idea related to it lead to a very difficult position. 13...ўxf7 14.Јh5+ ўg8 15.Ґd3 h6 was also played with a good statistics for Black. To 16.Јg4 it`s possible to respond with 16...dxe5. Perhaps, Ilya was confused by energetic 14.f5 over the board. In the game Berndt – Polzin (Hamburg 1997) Black was at his best in a difficult position and after 14...cxb2 15.fxe6+ Ґxe6 16.Јh5+ ўe7! 17.Ґg5+ ўd7 18.Ґxe6+ ¤xe6 19.Јf7+ ўc8! 20.Јxe6+ ¤d7 21.Јc4+ ¤c5 22.Јg4+ Јd7 23.Јxd7+ ўxd7 24.¦b1 Ґxe5 he got an attractive ending with two pawns for an exchange. 14.Ґxb2 Јa5+ 15.ўf1 ўxf7 16.Јh5+! Nakamura did not pay attention to to the d6 pawn, having evaluated the position after his next move correctly. If a destiny of my opening repertoire depended on the analysis of this position I would have probably found a possibility for Black to defend himself. No decision was found as I took his problems easy. A direct threat of White can be seen in the variation 17...dxe5 18.Јe8. Black has to give away a piece to defend against the capture on h7. After 18...h6 19.Јxc8 Јb4 20.¦b1 Јxf4+ 21.ўg1 Јe3+ 22.ўh2 Јf4+ 23.ўh3 Јe3+ 24.g3 there is no perpetual check. Let`s assume that it`s not difficult to parry queen`s invasion on the 1st rank. What is to be done with a simple idea ¦h3, followed by a capture on h7 and ¦g3? I came to the following 17...h6 18.¦h3 ¤c6 19.¦g3 dxe5 20.¦e1 with inevitable 21.¦xe5 (20.Јxh6 Јc7 21.ўe2! also wins with a rook`s hop on h1). It`s not clear what would change if we started with 17...¤c6. Another attempt - 17...b6, to respond 18.Јe8 with 18...Ґa6. But again – 18.¦h3 (in case of the immediate 18.Ґxh7+ White will also need to spend a tempo to defend against Јb5+) 18...Ґa6 19.c4. A capture of the h7 pawn can be postponed for just one move - 19...Јc5 20.¦c1! Then comes: 20...¤c6 21.Ґxh7+ ¤xh7 22.Јxh7+ ўf8 23.¦g3 Ґxc4+ 24.¦xc4 Јxc4+ 25.ўg1 ¦g8 26.exd6 ¤d4 27.Јh5+ ўf8 28.d7 with a win. Smirin tried arming himself with a fork. 17...Јb4. We can say that this answer was exaggeratedly cool-blooded. 18.¦b1 Ґd7. 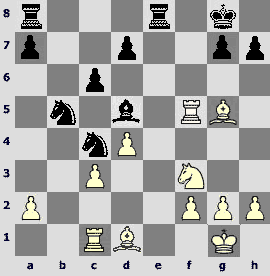 It turns out that in case of 18...Јxf4+ 19.ўe2 h6 20.¦bf1 White has a destructive attack. In reply to 20...Јg5 21.Јf7+ ўh8 a spectacular 22.Ґc1! Јxe5+ 23.ўd1 Јa1 24.Јxf8+! Ґxf8 25.¦xf8+ ўg7 26.¦hf1! works, but there is no defense against the mate. 19.c4!? A simple 19.Ґxh7+ ¤xh7 20.Јxh7+ ўf8 21.¦h3 is enough for a victory, though after 21...Јc5 he should have made a move 22.c4! anyway, 22.¦g3?? Ґb5+ is impossible. There is nothing wiser than 22...Јxc4+ 23.ўg1, and the game is over. At the moment the move 19.с4 also looks very attractive. 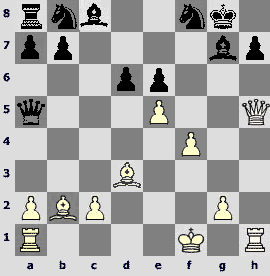 In this case all the ideas related to Ґb5 become unavailable, the b1-rook is protected. Once again he should puzzle over the problem, how to protect from the rook moves along the 3rd rank, which is decisive for the issue of the game, for example, in case of 19...h6. Once again Black tries to attack the bishop and the f4-pawn simultaneously with the queen, and once again he is disappointed. 19...Јd2 20.Ґxh7+ ¤xh7 21.Јxh7+ ўf8. 22.¦h4! It is much better than 22.¦h3 Ґc6. The rook will defend the pawns f4 and g2 and attack the g7-bishop. The queen controls the d3-square from h7. Black resigned. It was a very strong play by the young American. The experts mentioned a heroic route of the white king in the game Smirnov – Sakaev. In the following encounter the movements of the black queen were extremely elegant and abundant. 7.e3 (maybe White has a more precise move like 7.Јc2) 7...c5 8.dxc5. Shortly before Kacheishvili already had used this move order in the game against Kiril Georgiev in Dubai, who would be hell of a fellow for many strong grandmasters. That encounter continued with 8.Ґd3 c4, it revealed one of the ideas of Black – to play an "improved" Westphalian variation preventing the white bishop to jump on f5, because the black knight is still on d7. After 9.Ґc2 h6 10.Ґh4 ¤bd7 11.0-0 Јa5 White made an awkward move 12.¤e2. I think, it witnessed the defects of the chosen location. 8...¤bd7 9.¦c1 Јa5. Black carries out a typical plan of the counterplay along the e1-a5 diagonal. So far the opponents followed the course of the game Piket – Sosonko (Dutch championship, 1998), where Black played 10...Јxc5. 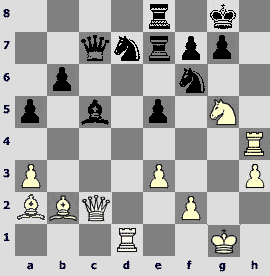 Ribli, who annotated this encounter, proposed 11.Ґe2 keeping an opening advantage. Georgian grandmaster shows a fresh interesting idea. 10...b6!? The Cambridge Springs motif of the unprotected g5-bishop is suddenly used. 11.a3. The intention of Black fully justifies itself in case of 11.cxb6 d4! 12.Ґxf6 ¤xf6 13.exd4 ¦e8+ 14.Ґe2 Ґa6, and White cannot free himself from the pins without losses: 15.¤b3 Ґxe2 16.¤xa5 Ґxd1+ 17.ўxd1 Ґxa5 or 15.0-0 Ґxe2 16.¤xe2 Ґxd2 17.¦c5 Јa6 18.b7 ¦ab8 19.Јxd2 ¦xe2 20.Јxe2 Јxe2 21.¦c8+ Јe8. It is much more interesting to get to know what is prepared as a reply to 11.c6. It seems that one should not play 11...Ґxc3 12.¦xc3 d4 13.Ґxf6 ¤xf6 14.¤c4, and White can be satisfied. And in case of 11...d4 12.cxd7 dxc3 13.bxc3 ¤xd7 14.cxb4 Јxg5 it becomes unclear at the first glance what for Black has given a pawn. Nevertheless, Kacheishvili must have expected to get the compensation somewhere, as there are no other options. The black queen shows the first inclinations to an increase of mobility that will develop in all its glory during the game. Now it hinders White to develop the queenside, and in case of 15.Јf3 ¦b8 16.Јg3 it will instantly bring all his influence over the queenside – 16...Јe7. After the text move Black obtains a convenient play for free. 11...Ґxc3 12.¦xc3 bxc5 13.Ґxf6 ¤xf6 14.Ґe2. Provided 14.¤b3 Јb6 15.¤xc5 (15.¦xc5? Ґd7) 15...Јxb2 16.¦b3 Јe5, white pieces are completely unprepared for a siege of an isolated pawn, therefore, Black has no problems. 15...Ґa6!? In such positions it is not prohibited to move the c-pawn (15...c4) fixing the weakness on b2; however, Black tries to impose a vivid combinational play to the opponent using his advantage in development. 16.¦xc5 ¦fc8! 17.b4. It is very hard to decide on 17.¦xa5 ¦xc1+ 18.Ґd1 at the board, although Black needs accurate actions to increase the initiative. In case of 18...Ґd3 19.¦xa7 somewhat slow 19...ўf8 leads to a profitable for White ending after 20.b4 ¦bc8 21.¤b3! ¦xd1+ 22.ўxd1 Ґc2+ 23.ўc1 Ґxb3+ 24.ўb2 Ґc4 25.f3. More drastic is 19...¤g4 (with a threat on 20...¦xd1+) 20.¤f3 Ґc4, preserving the tension. 17...¦xc5 18.Јxc5 (totally bad is 18.bxc5 ¤e4, e.g. 19.Ґxa6 ¦b1!) 18...Јxa3 19.Јxa7. 2 pieces of Black are attacked. The queen quickly settles an affair. 19...Јc1+ 20.Ґd1 Јc8. White would rather make a castle, but the pawn is still hanging. 21.Јd4 Јf8! What a beautiful maneuver! Just 3 moves ago the queen attacked this pawn from the other side of this diagonal! 22.f3? One had to recollect what our wise mentors had taught us in the game Nimzovich – Capablanca. (However, one hardly taught this the Chinese player). If there is such a bad luck with pieces, then one should better use an active queen to stir up trouble and to pull the wool over one's opponent's eyes. After 22.Јa7 it is hard for Black to keep the order of his ranks, for example, 22...Ґd3 (22...Ґb5 23.Јc5) 23.Јd4 Ґa6 24.Јa7 Ґc4 25.¤xc4 dxc4 26.0-0 Јxb4. It obviously became dull, but in the game Kacheishvili achieved the degree of cheerfulness he wanted to see, and probably even surpassed it. 22...¦xb4 23.Јa1 Јd6 24.¤b3? The last blunder. A right strategic idea comes across a rough tactics. Not good is also 24.ўf2 d4, only 24.Ґe2 allows a resistance. 24...¦xb3! 25.Ґxb3 Јb4+ 26.ўf2. Black also has a hanging bishop – but all this mess is organized not to win back a material. 26...Јd2+! 27.ўg3 (the first mate here is 27.ўg1 Јxe3#) 27...¤e4+! When the opponent makes such a move, it becomes clear that if you were like writing an essay on a given thesis before, now you would be forced to write a trivial dictation. 28.ўf4. Allow me please not to describe everything until the mate 28.fxe4 Јxe3+, there the variations are quick and branchy. 28...g5+ 29.ўe5 f6+ 30.ўe6 (30.ўf5 Ґc8#) 30...Ґc8+ 31.ўe7 Јb4+ 32.ўd8. «I am alone and everything is lost in the Pharisaism...» Not too much life is left. He crosses the board. 32...Јb8!? A fine decision. He could also mate with checks, that would be beautiful as well – 32...Јf8+ 33.ўc7 Јe7+ 34.ўxc8 (34.ўb6 Јc5#) 34...¤d6+ 35.ўb8 Јb7#. However, an idea of a discovered check looks more attractive. 33.fxe4. If 33.Ґxd5+, than 33...Ґe6+ 34.ўe7 Јd6+ 35.ўe8 Јf8#. 33...Ґf5+ 34.ўe7. And White resigned, not waiting for 34...Јf8#! In the next game the maneuvers of all white heavy pieces are easy and natural. The fact that they are totally dark-squared strengthens their aesthetic quality. Believe me, I know myself what I said. 1.e4 c5 2.¤f3 ¤c6 3.Ґb5 g6 4.Ґxc6 dxc6 5.d3 Ґg7 6.h3 ¤f6 7.¤c3 ¤d7 8.Ґe3 e5 9.0-0. 9.Јd2 is rightly considered to be more flexible. 9...Јe7 10.Јd2 ¤f8 11.Ґh6 f6. It is quite possible to play also 11...Ґxh6 12.Јxh6 f6. As it is usual to him, A. Ivanchuk chose a queer 11...¤e6 12.Ґxg7 ¤xg7 and after 13.¤e2 f6 14.¤h2 g5 15.a3 a5 16.c3 0-0 17.¤g4 Ґxg4 18.hxg4 h5 received a good play against Anand (Prague 2002). 12.¤h4. Surely the knight does not go anywhere, he just frees the way for the f-pawn. We have already seen how Black decisively ceased the opponent's play by means of g6-g5 even in case of a more modest behavior. Now he has to take into account the invasion on f5. 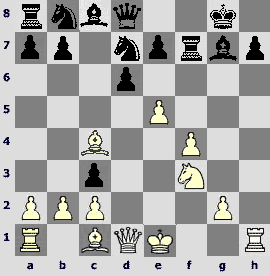 The encounter Baklan – Mochalov (Kiev 1995) developed in a more traditional way: 12.Ґxg7 Јxg7 13.¤e2 ¤e6 14.c3 0-0 15.d4 ¦d8 16.Јe3 cxd4 17.cxd4 exd4 18.¤exd4 ¤xd4 19.¤xd4 c5 20.¤b5 Јe7 21.¦fe1 b6 with an equal play. 12...¤e6 13.¤e2 0-0 14.¦ad1. This puzzling move had no influence on the further course of the struggle. Peter could already start an operation he started only on the next move. Perhaps he needed to make a warming-up like a jumper before a start. 14...b6 15.Ґxg7 ¤xg7. In case of 15...Јxg7 White can play f2-f4, because the fork g6-g5 after exchanges is no more dangerous in view of ¤f5. However, in reply to 16.f4 Black still had a sly answer 16...Јh6!? Loek probably supposed that a capture by the knight would remove from the agenda the movement of the f-pawn. He was wrong. 16.f4 exf4 17.¤xf4 g5. Better never begin, than never make the end. However, he had to play like this. Fritz considers 17...Јf7 as the main line even after a long-lasting analysis and leads Black along it straight in hell: 18.¤fxg6! hxg6 19.Јh6 ¦e8 20.¤xg6 Јe6 21.¦f4 f5 22.¦df1 Јf6 23.e5 ¦xe5 (23...Јe6 24.g4) 24.Јh8+ ўf7 25.Јf8+! ўe6 (25...ўxg6 26.¦g4+! winning a queen) 26.¦xf5! ¦xf5 (26...Јxf8 27.¦xe5+) 27.¦e1+ ўd5 (mate is everywhere – 27...ўd7 28.¦e7+ ўd6 29.Јd8+) 28.¤e7+ ўd4 (in case of 28...ўd6 White declares a double check 29.¤xf5+) 29.¦e4#. 18.¤hg6 hxg6 19.¤xg6 Јe8 20.¤xf8 Јxf8 21.e5 f5. A forced play launches. An attempt 21...¤h5 22.exf6 ¤f4 is unsuccessful in view of 23.¦xf4! gxf4 24.Јxf4. 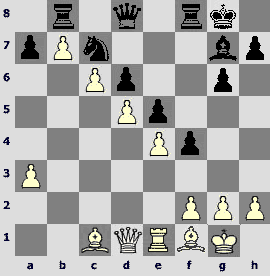 Black is unable to prevent from the decisive use of the white rook, e.g. 24...Ґd7 25.Јg5+ ўh7 26.Јh5+ ўg8 27.¦f1 Ґe8 28.Јg5+ ўf7 (28...ўh7 29.¦f4) 29.¦e1. It is time to admit that to make my difficult mission easier I have called Peter Svidler and enquired about his opinion concerning the created masterpiece. The multiple champion of Russia explained to me that this canvas was far from a masterpiece: "If Loek had understood in this position that the e6-square is intended for a rook, then probably only Black would have played for a victory. I have found a kind of a jump off, but it is needless to say that the whole plan is not entirely correct." However, Peter had to agree that the subsequent play of White makes a very pleasant impression. Thus 22...Ґd7 was the right continuation. I have sketched the variations with the help of my silicon friend, which evaluates very optimistically the position of White till a certain moment. 23.¦f4 (after 23.g4 it is possible to advise following endgame – 23...¦e8 24.¦de1 Јe7) 23...Јf7 24.b3 (24.g4 Јd5) 24...¦e8 25.¦e1 ¦e6 followed by ¦g6, and Black is all right. After the chosen by Loek 22...Ґe6? an improvisation on the black keys began. 23.¦f4 ¦e8 24.¦e1 Ґd7 25.¦e3 Јe7 26.Јg3 Јf7. Unsuccessful is also 26...ўf7 27.¦h4 ¦g8 28.e6+! Ґxe6 (28...¤xe6 29.¦h7+) 29.¦h6. 27.¦h4 ¦e6. 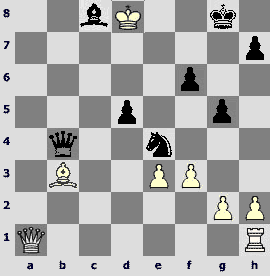 The queen move away from the action would be punished without a delay – 27...Јxa2 28.Јg6 Јe6 29.Јh7+ ўf7 30.¦h6. 28.Јf4 Ґe8. More logical would be 28...¦g6. 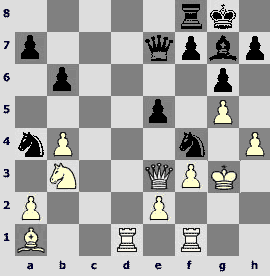 Provided 29.¦h6 ¤e6 30.Јh4 ¦xh6 31.Јxh6 f4 the rook does not reach g3. And in case of 29.¦g3 ¦xg3 (29...¤e6? 30.Јh6!) 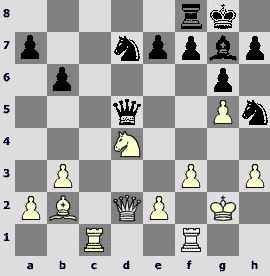 30.Јxg3 Black can capture a pawn, which finally becomes the reason of his defeat – 30...Јxa2. White still keeps an initiative after 31.¦h6, but it is far for clarity. 29.¦g3 Јf8 30.¦h6 Јe7 31.¦xe6 Јxe6. An exchange of one pair of the rooks does not disturb the harmony of white pieces interaction. They continue to move only along the dark squares and force the opponent to proceed to an endgame, where the a-pawn suddenly shows off. At the moment nothing in its appearance reminds of a queen, even distantly. 32.Јg5! Јxe5 33.¦e3 Јb8 (totally bad is 33...Јd4 34.c3 Јd7 35.¦e7) 34.¦e7 Ґf7 35.Јf6 Јf8 36.¦xa7 Ґe8 (or 36...Јe8 37.¦e7 Јf8 38.a4, and Black has no piece to move) 37.Јxf8+ ўxf8 38.a4 ¤e6 39.¦b7 c4 40.¦xb6 cxd3 41.cxd3. There are no obstacles on the way of the pawn, Black resigned. If two latter games according to Milan Kundera distinguish themselves by the lightness, then the next 2 examples are maybe heavier. 1.d4 ¤f6 2.c4 e6 3.¤c3 Ґb4 4.e3 0-0 5.Ґd3 c5 6.¤f3 d5 7.0-0 dxc4 8.Ґxc4 ¤bd7 9.Јe2 b6 10.a3 The main theoretical continuation is 10.¦d1. 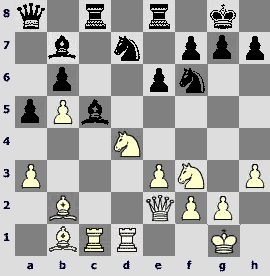 The following variation leads to a sharp game: 10.d5 Ґxc3 11.dxe6 ¤e5 12.exf7+ ўh8 13.bxc3 Ґg4. 11.¤b5. After 11.axb4 dxc3 12.bxc3 Јc7 13.Ґb2 Ґb7 14.Ґa6 Ґxa6 15.¦xa6 ¦fc8 16.¦d1 h6 17.h3 Јb7 18.b5 ¤c5 19.¦aa1 a6 Karpov had successfully resolved his opening problems in the encounter with Beliavsky (Linares 1989). 11.exd4 Ґxc3 12.bxc3 Јc7 is also quite inoffensive. 11...Ґe7. When Ivanchuk played with Beliavsky (Regio Emilia 1989), as always he went his own way – 11...d3 12.Ґxd3 Ґe7 13.¦d1 Ґb7 14.e4 Јb8 15.Ґg5 ¤c5 with a difficult play. 12.¤bxd4 Ґb7 13.b4 a5. Heretofore one played only 13...a6, for example, 14.Ґb2 Ґd6 (also possible is 14...b5 15.Ґb3 Јb6 16.¦ac1 ¦fc8 Wells – Suba, Benidorm 1991) 15.¦fd1 Јe7 16.¦ac1 b5 17.Ґd3 ¦ac8 18.e4 ¤e5 19.¤xe5 Ґxe5 20.¦xc8 ¦xc8 with an equality, Onischuk – Lautier, Moscow 2002. Black offers an exchange of the c6-square for the c5. 14.b5 Јc7 15.Ґb2 ¦ac8 16.¦ac1 Јb8. I think there is nothing bad in 16...¤c5 that suggests itself, however the champion of Denmark prefers not to show his cards for the moment. 17.¦fd1 Ґd6 18.h3 ¦fe8 19.Ґa2 Ґc5. Here in reply to 19...¤c5 one could play 20.¤c6 Ґxc6 21.bxc6 ¦xc6 22.Ґxf6 gxf6 23.¤d4 ¦cc8 with a well comprehensible initiative that one achieves for a sacrificed pawn. Anyway it does not look logical to move the bishop on c5 in two hops. 20.Ґb1. Of course, the diagonal b1-h7 is preferable, because there is only one pawn on the way of the bishop in this case. In 4 moves, when the position changes, it will return. So far the game proceeds leisurely. 21.¤c6!? It is clear that this encounter would not be among the nominees, if nothing had not happened in it. Tiger Hillarp made a move that brightened up the game, and there was something humiliating in the fact that the knight is set up on c6 exactly at the moment, when Black had taken a triple control over the square. 21...Ґxc6 22.bxc6 Јxc6. Another capture (22...¦xc6) look less risky. 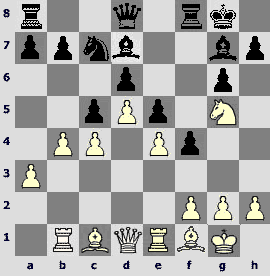 One brings over the rook on the same diagonal as the queen (while the pin along the c-file does not look dangerous). Beside positional means to develop an initiative (like 23.¤g5) White can make more captures – 23.¦xd7 ¤xd7 24.Ґxh7+ (or 24.¤g5 h6 25.Јh5 hxg5 26.Јh7+ ўf8 27.Јxg7+ ўe7 28.Јxg5+ f6) 24...ўxh7 25.¤g5+ ўg6 26.¤xe6 ¤f6. Please get me right – I did not say that it was good for White, but what for should one strain himself and calculate? 23.¦c4 e5 24.Ґa2 Јb7. 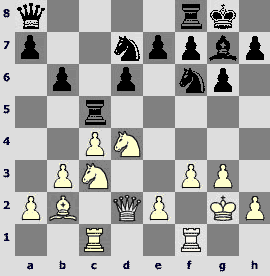 Also possible is 24...e4 25.¤d4 (25.¤g5 ¦e7) 25...Јb7 26.¤f5 ¤e5 27.¦c2 Јb8 with an unclear position. However, the move е6-е5 seems to be aimed at the dark-squared bishop, and Black did not want making it useless straight away. 25.¦h4 ¦e7 26.g4. 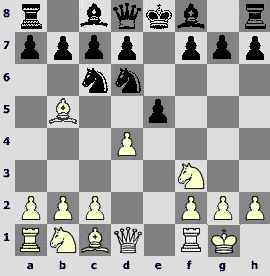 One has to add such kind of moves to the current symbol list of "Chess Informant". I would like to have in my disposal some signs to estimate the originality of White and to express the emotions that arouse because of the location of the rook on h4. The cross does not fit here, this position does not seem to be weak, but it is certainly ugly. 26...h6. One disregards 26...e4 27.g5! exf3 28.Јd3 once again. The attempts to cover the e4-square would not be successful here – 28...¦e4 29.gxf6 ¦xh4 30.Јxd7 Јxd7 31.¦xd7, and Black is unprotected, or 28...¤e4 29.Ґd5 Јc7 30.Ґxe4 g6 31.Ґxg6 Ґxe3 32.Ґxf7+ ¦xf7 33.Јxe3 with an evident advantage of White. However, after 28...¤e5 29.Ґxe5 ¦xe5 30.gxf6 g6 a strained position arises, and the chances of Black are not worse there. 27.g5 hxg5 28.¤xg5 ¦ce8? Another location would be right – 28...¦c7, and in case of 29.Јd3, one could play 29...¤f8. After the text move the e7-rook is surcharged. 29.Јc2 Јc7. One could not protect the g6-square by means of 29...¤f8, it would be followed by 30.Ґxe5! ¦xe5 31.Ґxf7+ Јxf7 32.¦h8+! 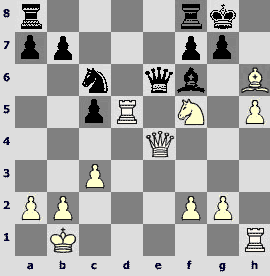 ўxh8 33.¤xf7+ ўg8 34.¤xe5 ¦xe5 with an advantage of White. And in case of 29...e4 30.Јe2, it seems that there is no sacrifice on d7, for example: 30...a4 31.¦xd7! ¦xd7 32.Ґxf6 gxf6 33.¤h7! 30.¦xd7! An immediate 30.Јg6 can be parried by means of 30...¤f8. However, now the queen can establish a foothold on h6 with all the convenience. 30...Јxd7.30...¦xd7 31.Јg6 ¦f8 (31...¦d1+ 32.ўh2) 32.¦h7 changes nothing. 31.Јg6 Ґxe3? Still being in the dark of the idea (and most likely in the Zeitnot). 31...¦e6 was the last opportunity to resist. In reply to an ambitious 32.Ґxe6 ¦xe6 33.¤xf7!? one can invent a cute 33...¤h7! (33...Јxf7 34.¦h8+) 34.Јxh7+ ўxf7 35.¦g4 Ґf8 36.Јf5+ ўg8 with quite an acceptable position. An unpretentious exchange of the minor pieces for more valuable objects –32.¤xe6 ¦xe6 (32...fxg6 33.¤xc5+) 33.Ґxe6 Јxe6. White has an extra advantage, but there is a long play ahead. 32.¦h7! The architecture is not perfect, but the building of White stands successfully. One has only to make sure that this construction can sustain the unrest of the furious bishop. 33.ўh2! (avoiding a perpetual check) 33...Ґg1+ 34.ўh1! Јc6+ 35.ўxg1 (now one can do it!) 35...Јc5+ 36.ўf1 Јb5+ 37.ўe1! It is symbolic – the king has returned at the initial location, Black resigned. Alexey Aleksandrov is one of the pioneers that use the Berlin Wall. It is hard to say whether he was surprised by this non-standard approach to the opening by Sarunas Sulskis, however, according to the database such kind of position after the 6th move occurred for the first time in practice of Aleksandrov. This position has already bored to death. However, this time the endgame turned out to be nothing of the Berlin kind. 6.Ґa4. This covered by the century dust weapon was used several times at the last Olympiad. 6...exd4. 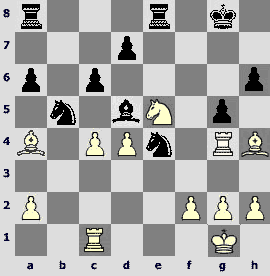 In the match of 1897 Schowalter – Pillsbury the position after 6...e4 7.¦e1 Ґe7 8.¤e5 0-0 9.¤c3 was the tabia. See the games Ganguly – Van den Doel, Kotronias – Georgiev and Sutovsky – Aronian. As I write a competitive survey and not a theoretical one, let us consider the information about the opening to be given. 7.c3 Ґe7. The triumphant of Hastings 1895 tried 7...dxc3 in the second encounter against Schowalter, where this variation was used. It was followed by 8.¤xc3 Ґe7 9.¤d5 0-0 10.¦e1 Ґf6 11.Ґf4 ¤e8 12.¦xe8 Јxe8 13.¤xc7 Јe4 14.Ґd6 ¦b8 15.Ґc2 Јg4 16.Ґxf8 ўxf8 17.Јd6+ Ґe7 18.¦e1 g6? 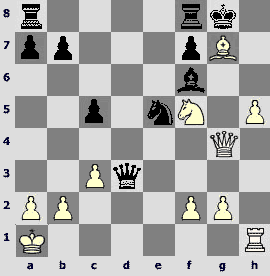 (it is a fatal weakening of the king's position) 19.Јd2 Јh5 20.¤d5, and White won. After that Pillsbury returned to 6...е4. 8.cxd4 b5 9.Ґb3 Ґb7. The game Janovsky – Burn (Munich 1900) developed 9...¤a5 10.Ґc2 Ґb7 11.¤e5 0-0 12.¤c3. At this moment Black decided to return a pawn, though he probably could play to keep the material advantage. However, after 12...¤ac4 13.b3 ¤b6 14.¤xb5 ¤xb5 15.Јd3 f5 16.Јxb5 a5 he had quite a good game. Chessplayers needed more than hundred years to become interested in this position again. 10.¦e1 0-0 11.¤c3 ¤a5 12.Ґc2 f5. Aleksandrov follows in Burn's footsteps. One could hold on to the pawn by means of 12...a6, for example. 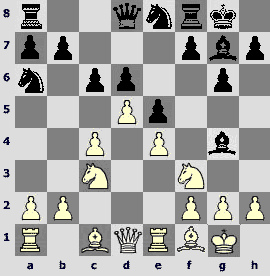 The text move allows a fork on b5 and е7. 13.Јe2 b4 14.Јxe7 bxc3 15.bxc3 Ґe4 16.Јxd8 ¦fxd8. The idea of Black becomes clear. He plans to arrange a blockade on the white squares. 17.Ґd1. A lop-sided 17.Ґxe4 ¤xe4 18.¤h4!? ¤d6 (18...g6 19.g4!) 19.Ґf4 ¤ac4 20.Ґxd6 ¤xd6 21.¦e5 g6 22.¤f3 would lead to a dull equality. Taking into account the style of Sarunas I suppose that he a) saw this possibility b) rejected it with indignation. 17...¤b5 18.Ґg5 ¦e8 19.¦c1 Ґd5. The treason of the principles for the sake of the cheap tactics does not bring dividends – 19...¤xc3 20.¦xc3 Ґxf3 21.¦xe8+ ¦xe8 22.gxf3 ¦e1+ 23.ўg2 ¦xd1 24.¦xc7 ¦xd4 25.¦xa7. The actions of both opponents were carried out in accordance with their aims: Aleksandrov felt right at home on the white squares, and Sulskis won a pawn having kept two bishops, but their power consists only in their number. At the same time the white pieces obviously lost their harmony in interaction. 22.Ґa4. It prevents from ¤bd6, that would follow, for example, on 22.Ґb3. There is a threat to take on d5. 22...a6 (22...¤bd6? 23.¦xd5 cxd5 24.Ґxd7) 23.¤e5 ¤cd6. Black has his own way. One could regain a pawn by 23...g6 24.¦f4 ¤xe5 25.dxe5 ¦xe5, however, after 26.h4 all signs of the awkwardness of White have disappeared. 24.¦f4 h6 25.Ґh4 g5 26.¦g4 ¤e4. 27.¤xd7 ¤exc3 does not work. In the variations 28.Ґxb5 axb5 29.¤f6+ ўh8 30.¤xe8 ¤e2+ 31.ўf1 ¤xc1 or 28.¤f6+ ўf7 29.¤xe8 ¤xa4 two pieces of White remain en prise, and he suffers material losses. Here we see a position, about which a Russian would say: "you cannot understand it without a few drinks". During the analysis I have drunk enough, but I am still not quite sure whether the conclusions are correct. However, I managed to elaborate an effective evaluation procedure: one has to count the number of pieces on the board (the pawns have no meaning) and the number of tactical units that are en prise to determine which part is in better conditions. 27...¤xd4 (Black has a more pleasant position) 28.cxd5? One should better play 28.¦e1 ¦xe5 29.cxd5 cxd5 30.Ґg3 (weaker is 30.f3 h5 31.Ґf2 ¤c6 32.fxe4 hxg4 33.Ґb3 – White is an exchange down, though the pair of improved bishops still gives a hope for a successful end) 30...¦ee8 (Black achieves nothing by means of 30...¤xg3 31.¦xe5 ¤de2+ 32.¦xe2 ¤xe2+ 33.ўf1) 31.Ґxd7 ¤xg3 32.¦xe8+ ¦xe8. 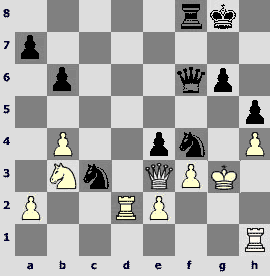 All the black pieces are en prise, however, one can capture only the g3-knight – 33.fxg3 (33.Ґxe8?? ¤de2#) 33...¦e1+ 34.ўf2 ¦e2+ 35.ўf1 ¦d2 36.ўe1 ¦d3 37.h4, and the action should be compromised peacefully. 28...¤e2+ 29.ўf1 ¦xe5? Both opponents unjustly ignore the c1-rook. 29...¤xc1 30.¦xe4 cxd5! (an important moment; bad is 30...gxh4 31.¦g4+ ўf8 32.¤xd7+ ўf7 33.dxc6) 31.¦e1 gxh4 would lead to an advantage, as Black preserves an extra exchange. 30.¦c2? White in his turn makes a mistake. 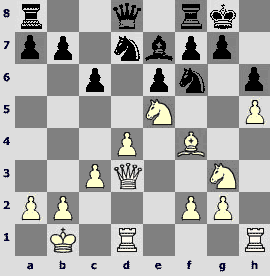 Right is 30.ўxe2 – because it captures the opponent 's piece, which attacks ours! However, after 30...¤f6+ the g4-rook should be courageously put at the mercy of Black, because it is impossible to support it – 31.ўf3 ¦f5+ 32.ўg3 ¤xg4, and if 33.ўxg4?, then 33...¦f4+ winning both bishops. Playing 31.ўf1 White receives a compensation for an exchange – 31...¤xg4 32.dxc6! (in case of 32.Ґg3 ¦xd5 33.Ґb3 ¤f6 34.Ґe5 ўf7 Black preserves an extra pawn in the rook ending) 32...dxc6 (32...gxh4 33.c7) 33.Ґg3. 30...¤d4 31.¦b2 cxd5. The difference in centralization is obvious. Moreover the white bishop is still a target of the g5-pawn. 32.f4. More stubborn is 32.f3 h5! 33.Ґf2 ¤e6 (it is better than a tempting 33...¤xf3 34.gxf3 ¤xf2 35.¦d4 ¤h3 36.Ґxd7 ¤f4 37.h4 ¦f8) 34.Ґg3 ¤xg3+ 35.¦xg3 ¤c5. There was a little mess once again, but the next move of Alexei sorted it out. 33...¤c3! Not wasting the time on 33...¦xf4 34.¦xf4 gxf4 35.Ґxd7. 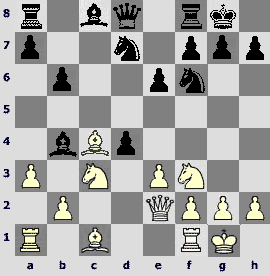 The rook is inviolable in view of the check on e2. 34.Ґxd7 ¤de2+ 35.ўh1 ¤xf4. Half of the white army is blocked on a narrow patch. The issue of the game is decided. 36.h3 ¦e7 (good is 36...¤e4) 37.Ґc6 ¦f6 38.Ґa8 ¤d1 39.g3 (39.¦b8+ ўh7 40.Ґg3 ¤e2 41.Ґxd5 ¤e3) 39...¤e6! In case of a hasty 39...¤xb2? 40.gxf4 White would have no piece en prise, but the situation remains hopeless. 40.¦b8+ (40.¦d2 ¤e3) 40...ўh7 41.ўg1 ¤c7. White resigned. He went too far searching for a harmony. Levon Aronian spoke favorably of the following victory of his teammate from the Bundesliga. 1.¤f3 ¤f6 2.c4 b6 3.g3 c5 4.Ґg2 Ґb7 5.0-0 g6 6.b3 Ґg7 7.Ґb2 0-0 8.d4. Usually one starts with 8.¤c3. 8...cxd4 9.Јxd4 d6 10.Јd2. 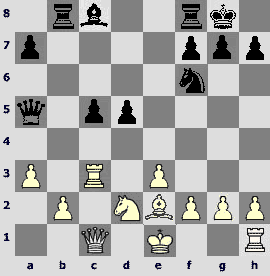 As a rule one does not hurry to move the queen at this moment – 10.¤c3 ¤bd7 11.¦ac1 and12.¦fd1. 10...¤bd7 11.¤c3 ¦c8 12.¦ac1. 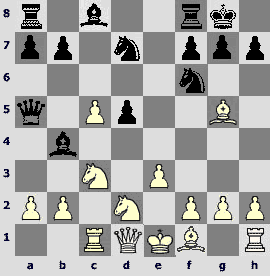 In the game Korchnoi – Adorjan, Wijk aan Zee 1984 after 12.¦fd1 a6 13.¤d4 Ґxg2 14.ўxg2 Јc7 15.f3 Јb7 16.e4 e6 17.¦ac1 ¦fd8 Black turned out to have a good hedgehog. Of course Black could also play 12...a6 here, but it seemed that Almasi had decided to take advantage of a bit sluggish play of the opponent. 12...¦c5 13.¤d4 Ґxg2 14.ўxg2 Јa8+ 15.f3. 15...¦h5! This rook move is really in style of Yurtaev. The queen and the rook of Black that are located at the maximum distance, interact perfectly. White has to take into account the concrete threatening. A naïve 16.e4 leads to the loss of material straight away after 16...Ґh6. However, one has not only to look after the diagonal с1-h6. Some interesting difficulties arise in case of 16.¦cd1 Ґh6 17.Јe1. If Black plays a self suggesting 17...¤g4, White protects the e3-square by means of 18.¤c2, and after 18...¦xh2+ 19.ўg1 a sudden attack of Black turns out to be unsound, and in view of the threat of ¤d5 White receives an obvious advantage. 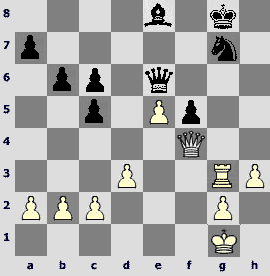 Nevertheless, Black can jumble the ranks of White using a typical resource of the hedgehog – 17...b5!. As usual it is unprofitable for White to allow an exchange on c4. 18.¤dxb5 also does not work, because after 18...¤g4 there will be nobody to protect the e3-square, and after 18.¤cxb5 a6 it turns out that the knight can return on c3. The point is that Black has gradually cleared one more diagonal by means of the pawn moves on the queenside! 19.¤c3 ¤g4 20.¤c2 ¦xh2+ 21.ўg1 (it seems that nothing has changed) 21...Јa7+ 22.¦d4 Јxd4+! 23.¤xd4 Ґe3+, and Black wins. A mean 19.¤a3 is right, and after 19...¤g4 20.¤dc2 ¦xh2+ 21.ўg1 ¦h5 22.e4 ¤gf6 a hard situation with mutual chances arises. 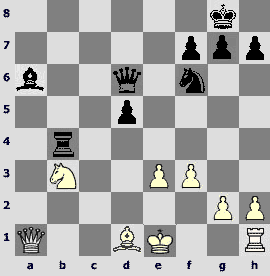 White solves the problem by other mean, preventing a thrust ¤g4. 16.ўg1 with the same idea was also playable. 16.h3 d5 17.g4. Surely, Almasi should have taken into account this principled answer in his preliminary calculations. 17...¦e5. And other moves do not save from the material losses, e.g. 17...Ґh6 18.f4 dxc4+ 19.¤f3. 18.g5 ¤h5 19.cxd5 ¦xd5 20.¤xd5 Јxd5. Crucial position. Black lacks an exchange, but the queenside of White is seriously weakened. If White manages to consolidate, then his advantage in power will influence the situation. 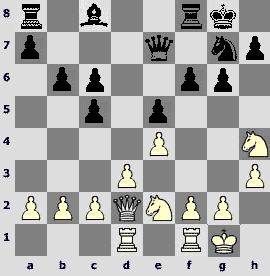 At the first sight, White has enough centralization, but in reality the black pieces arrive on the main scene in time. 21.¦cd1. In case of 21.e4 Јe5!? unprofitable is 22.¤f5 Јxb2 23.¤xe7+ ўh8 24.¦c2 Јe5 25.Јxd7 Јxg5+, and in case of other continuations the black knights occupy c5 and f4. 21...¤c5. The maneuver 21...Јe5 has lost its force due to the pawn on e2, because White can play 22.f4 Јe4+ 23.ўh2. 22.Јe3. A delay. Now Black plays е7-е5, guaranteeing the knight location on f4. Stronger is 22.b4. In case of 22...¤a4 23.Ґa1 Јe5 (23...e5 24.¤f5!) 24.f4 Јe4+ 25.ўh2 e5 there is 26.Јc2. A curious swindle 22...¤d3! 23.exd3 Ґxd4 24.Ґxd4 Јxd4 after 25.f4 ¤g7 or 25...f6 leads to a position, where Black has a compensation, but scarcely something more. 22...Јb7 23.b4 ¤a4 24.Ґa1. If 24.Ґc1, than 24...¦c8 25.Ґd2 ¤b2 26.¦c1 ¤c4 27.Јd3 b5, and the knight is even better located on c4 than on c5. 24...e5 25.¤b3 ¤f4+ 26.ўg3 Јe7 27.h4. 27...f6! Alluding to the fact that Black has a strong advantage in power on this side. 28.gxf6. An attempt to use the vulnerability of the a4-knight does not bring success – 28.Јe4 fxg5 29.e3 gxh4+ 30.ўh2 ¤h5 31.Јd5+ ўh8, and bad is 32.Јb5? in view of 32...Јg5. Nevertheless, White should have chosen this variation, just not looking aside on the flanks. 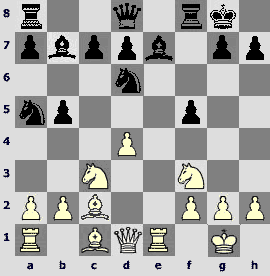 An exchange on f6 activates the black bishop. 28...Ґxf6 29.¦h1 h5! It is a move of a real master. Black does not need any exchanging operations like 29...Ґxh4+ 30.¦xh4 Јxh4+ (or even weaker 30...Јg5+ 31.¦g4 ¤h5+ 32.ўf2 Јxg4 33.Јxe5 Јh4+ 34.ўe3 Јf4+ 35.Јxf4 ¦xf4) 31.ўxh4 ¤g2+ 32.ўh3 ¤xe3 33.¦d7, which at best give an equal endgame. In such position Black has to give choice to his opponent, and a mistake will arise by itself. 30.Јf2? (30.ўh2) 30...e4! 31.Ґxf6 Јxf6 32.Јe3. 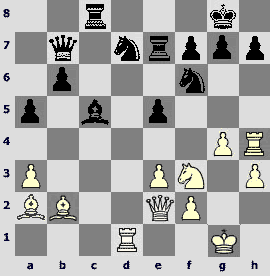 The simplest one-move variations show how strong is the position of Black: 32.fxe4 Јe5; 32.e3 ¤d3; 32.ўh2 ¤c3. 33...¤fxe2+! 34.¦xe2 (relatively better is 34.ўf2) 34...Јxf3+ 35.Јxf3 ¦xf3+ 36.ўg2 ¤xe2 37.¦e1 ¤f4+ 38.ўg1 e3 39.¤d4 ¦g3+ 40.ўh2 ¦h3+. White resigned. After 41.ўg1 ¤d3 he loses another pawn. The last encounter took the 7th place in the top list of April – it is the highest position among all the games of this survey. 1.¤f3 d6 2.d4 ¤f6 3.c4 g6 4.¤c3 Ґg7 5.e4 0-0 6.Ґe2 e5 7.0-0 ¤a6 8.¦e1 c6 9.Ґf1 Ґg4 10.d5 ¤e8. This continuation somewhat yields in popularity to another maneuver of the knight – 10...¤b4 11.Ґe2 a5, and also to an immediate 10...c5. 11.¦b1. Many strong chessplayers do not consider it disgraceful to ask the light-squared bishop of Black to clarify itself – 11.h3 Ґd7. Playing against Nijboer (Escaldes 1998) Bacrot treated this position not very successfully later on – 12.¦b1 c5 13.a3 f5 14.b4 f4 15.bxc5?! ¤xc5 16.a4 ¤c7 17.a5 ¦f7. Black fortified on the queenside and prepared for the attacking maneuvers on the king's flank. Our commentator Michal Krasenkow demonstrated an interesting strategy in the game against Peng Xiaomin (Sheniang 1999) – 12.a3 c5 13.¤h2 ўh8 14.ўh1 ¦b8 15.g3 ¤ec7 16.f4 f6 17.¤f3 b5 18.g4 bxc4 19.f5. Suddenly the opponents changed the flanks, it is not in style of the King's Indian. In the encounter Gelfand – Gallagher (Bille 2000) after 12.dxc6 bxc6 13.Ґg5 f6 14.Ґe3 c5 15.¤d5 ¤ac7 16.b4 ¤e6 17.¦b1 ўh8 a difficult position arouse. Gallagher uses this scheme quite often. The trainer of Olympic champions had an opportunity to prepare. 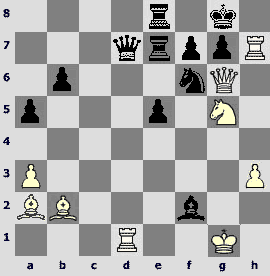 White decides to save on the move h2-h3. 11...c5 12.a3 Ґd7 13.b4. The play of White on the queenside did not come soon in the encounter Akesson – Gallagher (Gausdal 2001) – 13.g3 f5 14.Ґh3 f4 15.Ґxd7 Јxd7 16.ўg2 h6 17.h3 g5 18.¤h2 ¤f6 19.g4 ¦f7. The most annoying thing is that one failed to build a save redoubt. Black won the game. 13...f5. 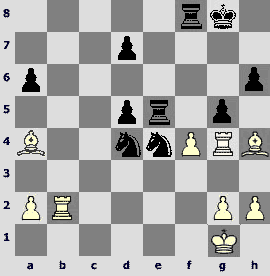 Gallagher played more cautiously against Schaufelberger (Zurich 2002) – 13...b6 14.Ґd3 f5. Tukmakov reacts to the move of the f-pawn entirely according to the King's Indian. 14.¤g5 ¤ec7 (it is necessary to protect the e6-square) 15.¤b5. White knights achieved the high level of synchronization in this game and they even left the board one after another. The fight for the e6-square continues. 15...f4. White gains a great advantage in case of 15...h6 16.¤xd6 hxg5 (or 16...cxb4 17.¤e6 ¤xe6 18.dxe6 Ґxe6 19.axb4) 17.¤xb7 Јf6 18.bxc5. An avalanche of pawns is obviously stronger than the pieces that are in its way. 16.¤xc7 ¤xc7. From the standpoint of what had happened in the game before we should pay attention to 16...Јxc7, when the b7-pawn remains without protection. Now doubtful is 17.¤e6 Ґxe6 18.dxe6 Јe7 19.Јd5 ¦ab8 20.¦d1 ¦fd8 followed by ¤c7, and Black captures the e6-pawn. In reply to 17.b5 Black can play 17...Јb6! (in case of 17...¤b8 already strong is 18.¤e6 Ґxe6 19.dxe6 Јe7 20.Јd5, because the black king leads a dog's life) 18.Ґd2 ¤c7 19.a4 ¤e8. White did not open the play on the queenside in time, and Black is about to attack on the king's wing. 17.bxc5! It is a brilliant idea that was entirely realized not unaided by Black. 17...Јxg5 18.¦xb7 Јd8. And here after 18...¦f7 19.¦xc7 Ґg4 20.f3 ¦xc7 21.cxd6 we are dazzled of the white pawns. 19.c6 Ґc8 20.c5 Ґxb7. This game had a low place in the list of Sergei Klimov. Of course he liked its appearance, but Sergei was puzzled what could have happen in case of 20...dxc5. I am ready to share his perplexity: the combination of Tukmakov is good anyway, but after the rook capture the fight almost finished, meanwhile in case of 20...dxc5 White would have to prove that he had enough resources to run the blockade. 21.d6 Ґxb7 22.cxb7 ¦b8 23.dxc7 Јxc7 24.Ґc4+ ўh8 25.Ґd5 would be completely wrong, and Black could just capture on b7, if he does not find anything better. A principled continuation is 21.¦b3 Јd6 22.Јc2. White has 3 heavy pieces and a dark-squared bishop to attack the c5-pawn. However, he needs time to organize this siege. Black can bring over the bishop on f8, he has the a6-square for other minor pieces, and a thrust f4-f3 irritates, though it is not dangerous. Perhaps, some aesthetic chords were affected in the soul of Joseph Gallagher. It reminds the works of Moris Escher. 22...f3 23.g3 h5 24.Ґe3 a6 25.Ґa7 h4. 25...Ґh6 is more stubborn, it prevents from ¦e3, but after 26.Ґxb8 Јxb8 27.Јa4 the issue of the game is clear. 26.Ґxb8 Јxb8 27.¦e3 hxg3 28.hxg3 Јa7 29.¦xf3 ¦b8 30.¦b3 Јd4. Black accomplished a classical maneuver Јd8-b8-a7-d4 and after 31.Јg4 resigned straight away. Here this story is over.